Long, long ago, when Jesus was living on the Earth, he had three very good friends, who were two sisters and a brother. The sisters were named Mary and Martha, and the brother was named Lazarus. Now, Lazarus got very, very sick. He was so sick that his sisters were afraid he might die. 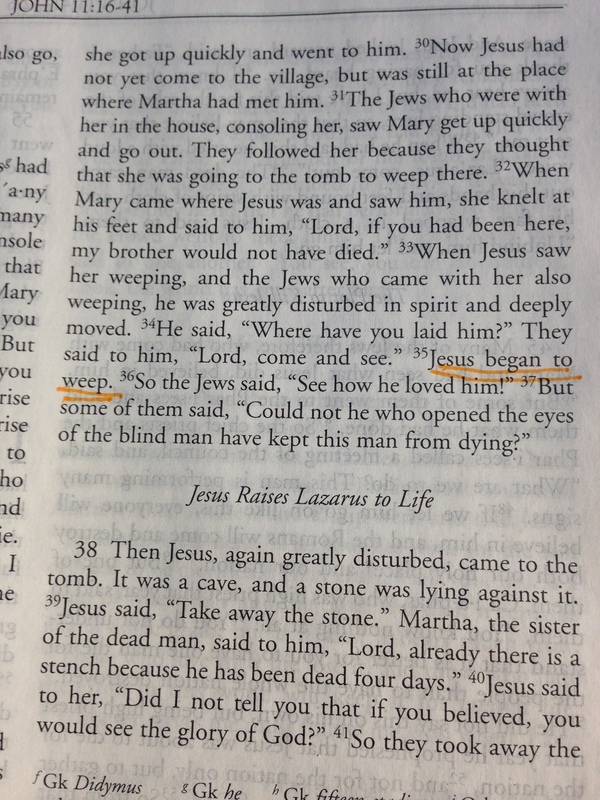 They sent word to Jesus, but by the time he got to their town, Lazarus had already died. His sister Mary was crying. His sister Martha had been crying, too. They were both very sad, because they loved their brother very much. When Jesus saw them, he cried, too. Crying is a good thing to do when we’re sad. If we didn’t cry, we would still be holding onto the feelings that come out with our tears. Jesus and his friend cried. But they didn’t just cry. Mary and Martha felt all kinds of upset. Martha even yelled at Jesus! Sometimes when someone we love dies, we feel sad *and* angry. Jesus still loved Martha even after she raised her voice, because that’s how it is between friends. When our friends are sad because someone has died, one of the best things we can do is just listen to how they are feeling. And I want you to know it’s okay to be angry, just like it’s okay to be sad. When you feel angry, you can tell someone you trust. Just remember you’re not angry with them! Sometimes when we’re angry – well, almost every time – we can feel it all over our bodies. That’s a good time to go for a walk or a run, or to ride your bike really fast (just be sure you put on your helmet…) or to punch a pillow, or even to ask a grown-up if you can hammer something. Just be sure to talk to somebody. Even if you can’t tell them too much about why you’re angry, the people who love you will want to help. You can talk to them, too, if you don’t understand why a sad thing happened. When someone we love dies, we all wonder why it had to happen. We understand that people’s bodies sometimes get sick and don’t get better, but it feels especially bad when it happens to someone we love. After someone dies, people like to tell stories about them, about the things they did and the people they loved. Those stories might make us cry a little at first, but the next time we tell them, we may start to feel like smiling when we remember. And that’s okay, too. God sent Jesus to be with people and help them because God loves us so much and wanted to be closer to us. And God understands how we feel when we’re sad, because God remembers what it was like the day Jesus cried about his friend. One of the ways we can feel closer to God when we’re sad, or we’re angry, is to pray. We close our eyes and make our minds quiet, and then we talk to God. It’s okay to pray out loud or to pray quietly, so that only God can hear. Let’s pray together. O God, we thank you for loving us, even when we are angry. We thank you for loving us, especially when we are sad. Help us to talk to you and to talk to each other about the way we are feeling. We ask in Jesus’ name. Amen.